When I went to the launch of the Dodge Dart back in May of 2012, I got to drive a host of different variations. The normally aspirated 2.0-liter MultiAir engine (160 horsepower and 148 ft/lbs of torque) felt kind of pokey. The 1.4-liter MultiAir turbo engine (160 horsepower and 184 ft/lbs of torque) had much more oomph, although there was quite a bit of turbo lag. 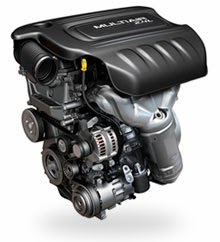 And the 2.4-liter Tigershark MultiAir II engine—well, that wasn’t available to drive yet. Dodge was billing the 2.4-liter engine, which we were told made 184 horsepower and 174 ft/lbs of torque, as the Dart’s performance-oriented powerplant. And although it would’ve been great to compare it head-to-head with the 1.4-liter turbo four-pot, alas, it didn’t happen. In early 2013, I spent a week with the 1.4-liter turbo Dart Rallye. It came equipped with the manual transmission, had on-or-off throttle response, but possessed a mean growl. Think Fiat 500 Abarth at about 3/4 volume. The combination was entertaining, at least above 2,500 RPM. But now it’s 2014 and I'm finally able to drive a Dart with the 2.4. So how does it compare to other Dart engines? To take a short step back, when visiting family in Boston in April, we had a Dart rental car with the 2.0-liter engine and the automatic transmission. It reminded me that while the 2.0-liter engine wasn’t going to win many races, the car felt solid, looked good, and had a very willing chassis. (Thank you Alfa Romeo.) And despite the fact this Dart was living the awful life of a rental car in Boston, it was still a pleasing automobile. Certainly more pleasing than some of the driving appliances that were available for rent. Jumping back to the present, an extremely vibrant “Header Orange” Dart was adorning our driveway. No worries about being seen in this car. Hell, I think you could see it from space. Now don’t get me wrong, I love the color orange. My Yaris has orange wheels. I own an orange North Face Jacket. My travel mug is orange. But orange doesn’t necessarily look good on all cars. A new Jaguar F-Type Coupe? Yep, that works. A Dodge Challenger SRT? Most certainly. A Dodge Dart? Ehhh … not so much. Orange is a color that commands attention. It’s aggressive. It says, “Hell yes this car is orange.” To me, the hue doesn’t work so well on a Dart. 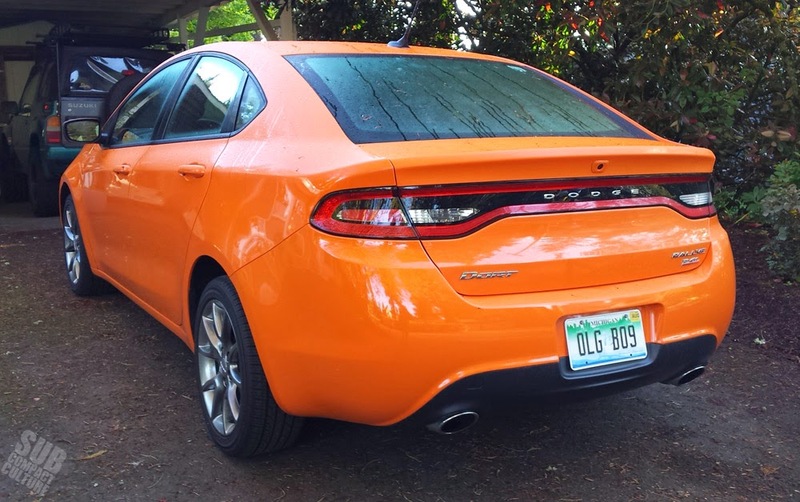 In “Granite Crystal Metallic”—a sort of gunmetal gray—the Dart looks expensive and elegant. In “Redline 2 Coat,” the car looks sporty and glossy. An orange Dart to me looks like someone got a deal at Maaco. Despite the color, I still think the Dart is an attractive sedan. It has graceful, modern lines, a fairly aggressive front fascia, and a dual-exhaust-clad derriere that look pretty good for a compact sedan. Ours was equipped with the trademark racetrack LED rear taillights, too. Inside, the Dart feels big, perhaps a bit bigger than I’d like (hey, this is supposed to be a compact). However, it is spacious and comfortable. The Uconnect infotainment system continues to be a high point, with intuitive operation, notably decent audio, and easy-to-use Garmin navigation. The climate control and other bits are also simple and well thought out. One thing that did drive me mildly bonkers is the fact that the turn signals and wipers are on the same stalk. I also found the gauges a bit difficult to read. The back seat is a bit cramped in the leg-room department. And considering the Dart’s compact-plus sizing, that’s a bit of a surprise. The good news is, so long as your legs are short, the rear seat is comfortable. The trunk is decidedly medium-ish. There were some squeaks and rattles in the dart; some from the dashboard, some from the doors. Engine noise was minimal, although road noise was plentiful. Then again, the car has 45-series tires. But the main story here, despite the previous 600 words I typed, is the engine. The engine certainly feels more powerful than the 2.0-liter Tigershark. After all, it’s got 24 more horsepower and 26 more ft/lbs of twist. It doesn’t feel all that fast, however. Certainly, the 1.4-liter turbo engine creates the illusion of being faster, what with its peaky turbo and burbling exhaust note. Also, the 1.4 has 10 more ft/lbs of torque. The problem is, you have to wait a couple thousand RPMs to get to it. And this is why the 2.4 liter is likely faster. The power is certainly more instantaneous. There’s no waiting for boost. No spooling up. Here’s your no-replacement-for-displacement argument. But again, the 1.4-liter engine presents the illusion of being faster. Pitting apples to oranges (color pun intended), our 1.4-tester was a manual transmission and this 2.4 was mated to the company’s six-speed Powertech automatic, which uses a traditional torque converter. (A dual-clutch automatic is only available with the 1.4-liter turbo engine.) I had no gripes about the Powertech, but nothing jumped out as amazing, either. Fuel economy is another story. Our 2.4-liter tester gets an estimated 22 city and 31 highway MPG on regular-‘ol gas (23, 33 with the manual). Not stellar, but this is supposed to be the performance engine. For comparison’s sake, the turbo 1.4 is rated at 28 city, 40 highway with the automatic transmission (28, 41 with the manual). However, the 1.4 drinks premium. All Darts ride on a chassis shared with the Alfa Romeo Giulietta, and that’s a good thing. The chassis has a very European feel to it (shocking, I know). It rides supplely and feels balanced and solid. Steering is quick and has good feel. The chassis is certainly one of the brightest spots on in the Dart family as a whole. The Dart handles predictably, even when pushed, and impresses in the corners. Our Rallye trim spec came with attractive 17x7.5-inch alloys wrapped in fairly wide 225/45/17 tires, which likely aid in that good grip. 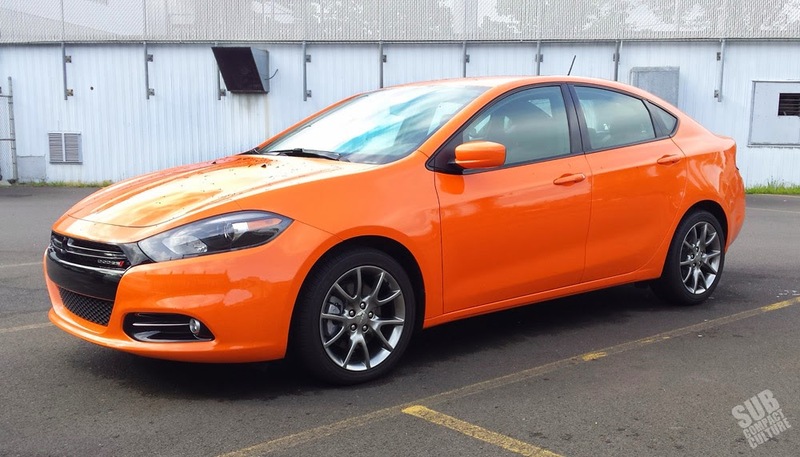 Our Dart Rallye with the 2.4-liter engine, six-speed transmission, 17” wheels and tires, Uconnect infotainment package, Rallye appearance package, and all the standard features came in at a very reasonable $22,520 including destination. I’d say that’s a good deal. 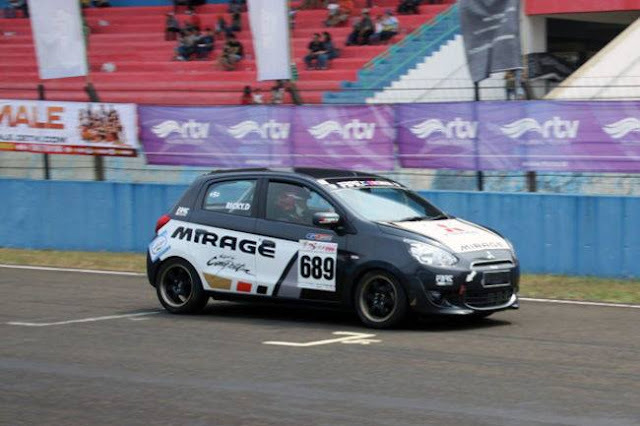 You get a very willing chassis, a strong engine, a large, comfortable interior, and a handsome shape. Deciding which transmission/engine/trim level combo can be a bit daunting, especially since Dodge switched things up vs. the 2013 models. But for 2014, there are five trim levels: SE, SXT, Aero, GT, and Limited. (The Rallye thing is just an appearance package, and technically, this tester is an SXT.) To break down the engine/trim level combos, the 2.0 can only be had on the base-model SE. The 1.4 only comes with the Aero. The 2.4 is standard on the SXT and GT, and the Limited. All models can be had with a six-speed automatic or six-speed manual, sans the Limited which is auto only. See, that wasn’t so hard, was it? The Dart isn’t perfect, but I can’t help but like it. It’s got personality; it’s got character; it’s got something to talk about. It doesn’t feel sterile or appliance-like, and perhaps that’s why I’m drawn to it. 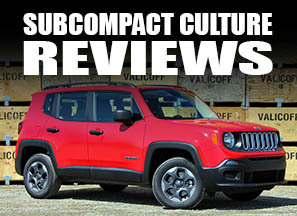 And while it’s on the larger end of the compact car spectrum, it also has a lot going for it. If I were to buy a Dart, it wouldn’t be orange, despite my initial instinct to like all orange things. However, it also wouldn’t be the 2.4. I’d likely still opt for the 1.4-liter turbo which gets better mileage, is more entertaining to drive, but does drink the expensive go-juice.